A favorite place to visit growing up was Lincoln Road on South Beach. My Great Aunt had an art studio there, so my mom and sister and I would often go down to visit on school days off to be “ladies who lunch.” We’d pop into stores and galleries and treat ourselves to a great day while people watching. A favorite gallery of mine was always Romero Britto’s. The Brazilian artist’s trademark is the bold colors, pop designs, and joyful characters in his art. Who else is ready to jet set, now? I know this is completely over the top, but that is the Florida in me. I love the color, I love the hearts (I love hearts), and I love joyful, happy attitude. Besides what else do you need when traveling besides some clothes and a happy heart? 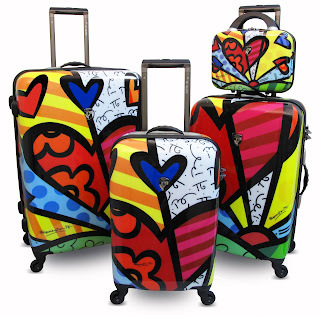 This entry was posted in Her Closet, Shopping, travel and tagged art, bethheny getting married, miami heat, romero britto, south beach, travel luggage. Bookmark the permalink.